and see yourself running with them. Your life story is an expression of who you are; the words you choose to use shape this story. Your words create the essence of your inner culture and the core of your identity and destiny. How have you written your story so far? Have you put your words to positive use? If I eavesdropped on your self-talk or your conversations with others, would I hear statements that create happiness, or statements that refute it? Your ability to write a happy life story hinges on your language. It is your inner and outer verbal expression that makes your joy possible and that infuses your life with purpose, meaning and vitality. You can’t build anything wonderful with ideas of what you are going to do someday. If you want something, you have to make a little noise, declare it and then get started. In the end it doesn’t matter what you’re thinking, it matters what you’re doing. Whatever you want to accomplish, it’s time to get started. Read The 7 Habits of Highly Effective People . Generally speaking, the unhappiest people you will ever meet will be those who are utterly self-absorbed; the happiest people you will ever meet will be those who lose themselves in the joy and challenge of helping others. Happiness is always attained by giving it away without expectation. Those who help others are eventually helped. You have two hands, one to help yourself and the other to help those around you. If you can lie down at night knowing in your heart that you made someone’s day just a little brighter, you have something to smile about. Read 1,000 Little Things Happy, Successful People Do Differently. The way you move a mountain is by moving one stone at a time. Every stone you move, no matter how small, is progress. Sometimes it may be hard to see your progress. Sometimes it will be frustrating when the results you seek don’t appear as quickly as you had hoped. Still, you are advancing. You may be moving along slowly, but you are still moving a mountain. Achievement, after all, is an enduring process, not a single event. To achieve any worthwhile goal you must cover a lot of ground. You need to learn what works by trial and error. You must explore possibilities, many of which will only show you what doesn’t work. Just keep in mind that the mistakes and setbacks are a vital part of the process. Take a break every now and then and pat yourself on the back. Applaud yourself for doing what needs to be done. And be careful not to spend so much time looking at how far you still have to go, that you forget to appreciate how far you’ve already come. The happiest of people aren’t the luckiest, and they usually don’t have the best of everything either. They simply make the most of everything they do have. The reason so many people are unhappy is because they tend to look at what’s missing in their life, instead of what’s present. Take a stand and flip the switch. Stop wishing you had more. Stop wishing you were somewhere else. Stop wishing you looked like someone else. Love your quirks enough to let them shine. Appreciate your body and use it to it’s full potential. Appreciate the things you have that so many others dream about. Scream it out loud if you must: “I am lucky to be alive! I am happy to be me right now! I have way more than I need and so much to be grateful for! 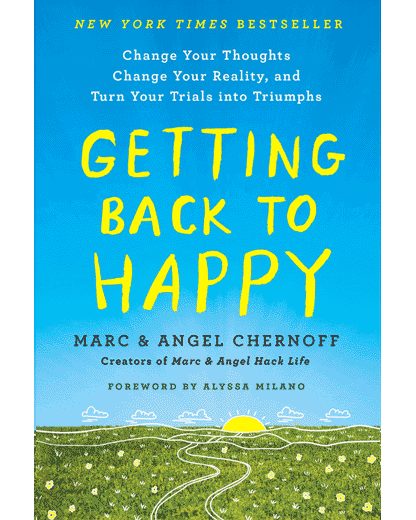 My life isn’t perfect, it’s just pretty darn good!” Read The Happiness Project . That blank space denoted by “ … ” is no mistake. That space represents silence. Silence is soothing. Silence is peace. Silence is divine. The more silent you are, the more you can hear yourself think. Have you ever heard the silence just before the sun peaks over the horizon? Or the hush of a country road at midnight? Or the peaceful calm just after a thunderstorm ends? Or perhaps you know the silence in the back of your city library, or the eager pause of an auditorium full of people when the lights dim for the main event, or, best of all, the moment just after the front door shuts and you suddenly have the whole house to yourself? Each silent moment is different, yet all are beautiful if you listen carefully. Leave enough space in your day to enjoy the space between the commotions. Say nothing, think quietly, just be and breathe. What would you add to the list? What’s something positive (perhaps an affirmation) we all should say every day? Please reply below and let us know. @Joan Harrison: I like that idea – starting every day off with one positive thought. @Lisa Holland: It’s inspiring to hear that you’re trying to reach out and help your friend. I’m glad we could assist. Best of luck to you. @jasmine: Such a beautiful thought, and so true. There are amazing people in this world who are looking forward to meeting you. @Amandah: Spot on as usual! If you don’t take full responsibility for your life, someone else will try, and you’ll likely end up somewhere you don’t want to be. @Sandra Hamlett: I love that. Let’s redefine ourselves using the most positive words possible. @David Rapp: I love your point about having more love to give. It’s such an important reminder. Thank you. @Cindy Baily: Lovely mantra. Being grateful is so important. It’s something Angel and I practice every day. @Pamela Harper: So true. That Boston incident made me sick. Such a cruel reminder of how lucky we are to be healthy and safe on a daily basis. @Remy: Bingo! We can all make a difference… and we all should. @Franko: So true. Lucky people are usually just hard workers with a well thought out plan. @Joy: Heartbreaking and inspiring simultaneously. Thank you for sharing that short story with us. @All: As always, you are beautiful and appreciated. Thank you so much for sharing your thoughts with us. We know we are lucky to be connected with such heartfelt, sincere human beings. We feel truly honored to be part of this community. I can make a positive difference in someones life. Dreams are made to be realized! This is my personal motto. I love dreaming knowing that nothing is impossible.. well ok flying is impossible. Never working on your dreams! Courage to speak with your heart no matter how short it may be. Because it takes courage to tell the truth. I agree with you my friend we should say positive words every day that make us see life from a positive perspective. And we all know that positive thoughts lead to positive results. Thank you so much for these great tips. Love this. Love you all. I really look forward to reading these blogs…life is what you make it. I have what it takes 🙂 I love it!